Posse is one of the most comprehensive and renowned college access and youth leadership development programs in the United States. Founded in 1989, Posse identifies public high school students with extraordinary academic and leadership potential who may be overlooked by traditional college selection processes. Posse extends to these students the opportunity to pursue personal and academic excellence by placing them in supportive, multicultural teams-Posses-of 10 students. Posse partner colleges and universities award Posse Scholars four-year, full-tuition leadership scholarships. Through Posse’s distinctive program, partner institutions meet their diversity goals, experience a changed campus and broaden their selection scope, while sacrificing nothing in the way of student quality. With support from the Posse program, Scholars are excelling academically, founding and leading campus organizations, taking on competitive internships and earning prestigious awards. 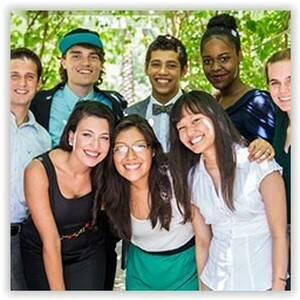 From September through December each year, Posse conducts the Dynamic Assessment Process (DAP), a unique evaluation method designed to identify young leaders who might be missed by traditional admissions criteria, but who can excel at selective colleges and universities. Using non-traditional forums to evaluate potential, DAP offers students an opportunity to demonstrate their intrinsic leadership abilities, their skill at working in a team setting, and their motivation and desire to succeed.